The vision and mission of Love's Bloom is to LOVE a person through temporary financial help, so they can get motivated and encouraged to live and enjoy life! Unfortunately, not everyone is in a position to ask for help. We want to reach these people, the ones desperate for help but unable to seek it. Injustice comes in many forms and unfortunately some can be overlooked or not prioritized. Everyone should have the chance to experience love and life. Sometimes what people need is love. Simple love expressed through kindness, community and compassion. Love's Bloom currently helps pay for the monthly rent and utilities for the Hands of Hope ministry. The women of this ministry gather in this space to work and also meet as a group to build relationships. Love's Bloom is currently helping to rebuild Jonathan's house. 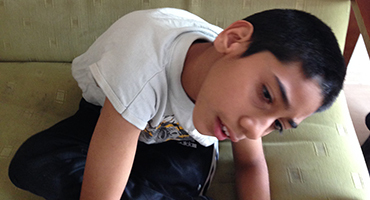 He is a disabled young boy with no means to improve his living arrangements. 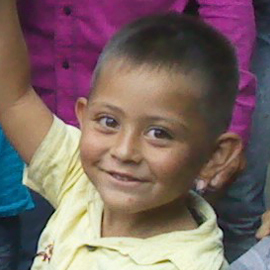 In addition to putting in new floors, we are fixing the roof and building a room for Jonathan. 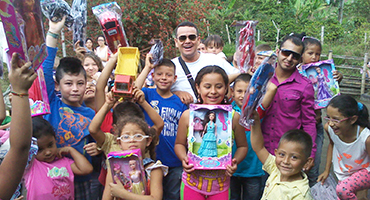 Love's Bloom was able to giveaway 200 gifts this Christmas to children in Colombia! Every child deserves the joy of a brand new toy! Thank you for your support and helping making this a reality. 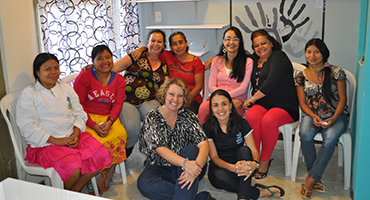 Through the Hands of Hope Ministry, we have been able to provide a safe place of work and community for these women. By supporting each other, they are walking into a new place of peace and hope! All proceeds will go towards supporting various projects and ministries!